Powertech has introduced a new power systems dynamic simulation platform called TPI, which enables co-simulation studies simultaneously using the two longtime industry standards TSAT (for electromechanical transients) and PSCAD™ (for electromagnetic transients). Co-simulation studies aim at combining detailed modeling capability available in Electro-Magnetic Transient (EMT) packages with bulk power system simulation of Transient Stability Assessment (TSA) tools. This approach helps engineers to simulate a much larger system while reducing cost, effort, and time needed to set up the system model and run the simulation. Additionally, the engineer can analyze aspects of system dynamic behavior that may not be captured in a purely EMT- or TSA-study. The TSAT-PSCAD™ Interface (TPI) module is an add-on module to TSAT, which enables users to perform co-simulation studies using TSAT and PSCAD™. 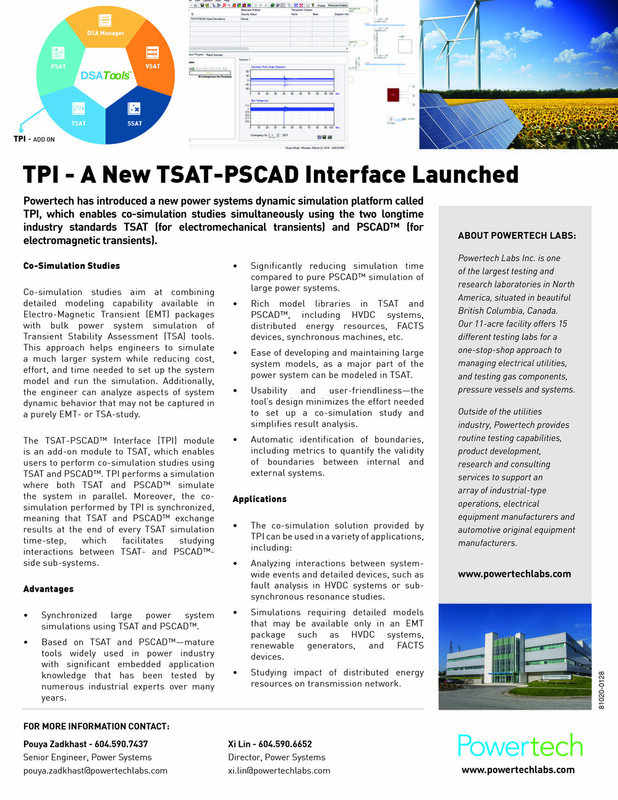 TPI performs a simulation where both TSAT and PSCAD™ simulate the system in parallel. Moreover, the co-simulation performed by TPI is synchronized, meaning that TSAT and PSCAD™ exchange results at the end of every TSAT simulation time-step, which facilitates studying interactions between TSAT- and PSCAD™-side sub-systems. Synchronized large power system simulations using TSAT and PSCAD™. Based on TSAT and PSCAD™—mature tools widely used in power industry with significant embedded application knowledge that has been tested by numerous industrial experts over many years. Significantly reducing simulation time compared to pure PSCAD™ simulation of large power systems. Rich model libraries in TSAT and PSCAD™, including HVDC systems, distributed energy resources, FACTS devices, synchronous machines, etc. Ease of developing and maintaining large system models, as a major part of the power system can be modeled in TSAT. Usability and user-friendliness—the tool’s design minimizes the effort needed to set up a co-simulation study and simplifies result analysis. Automatic identification of boundaries, including metrics to quantify the validity of boundaries between internal and external systems. Analyzing interactions between system-wide events and detailed devices, such as fault analysis in HVDC systems or sub-synchronous resonance studies. Simulations requiring detailed models that may be available only in an EMT package such as HVDC systems, renewable generators, and FACTS devices. Studying impact of distributed energy resources on transmission network.